Card Text : T: Permanently change the text of target white enchantment you control that does not have cumulative upkeep by replacing all instances of one color word with another. For example, you may change "Counters black spells" to "Counters blue spells". 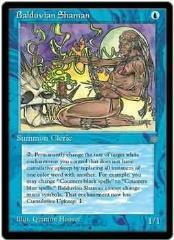 Balduvian Shaman cannot change mana symbols. That enchantment now has Cumulative Upkeep: 1.